It’s time for the final installment of my series commemorating the evil impact of 100 years of communism. On November 7, we reviewed the silver lining of anti-communist humor. Today we’re going to wrap up the series with a look at Che Guevera and contemplate how a mass-murdering racist and homophobe became a cultural icon. Jay Nordlinger looks at the legacy of Guevera in a column for National Review. Writing for the Washington Examiner, Tom Rogan has a good summary of Guevera’s monstrous life. Che Guevara was definitely evil, almost certainly a moron, and possibly also a psychopath. …Acting as Castro’s Treasury Secretary, Guevara ignored the failures and associated moral hardships his collectivist policies imposed. …Guevara may have been a psychopath. …for ideological zealots like Guevara, purifying the Earth of non-believers is an act of the highest moral order. In Guevara’s blood lust, we see his mental union with the propaganda offerings of ISIS… Guevara was also intellectually defective to the point of being a moron. …Guevara’s fervent obstinance planted the roots of far-left delusion that prevail today. 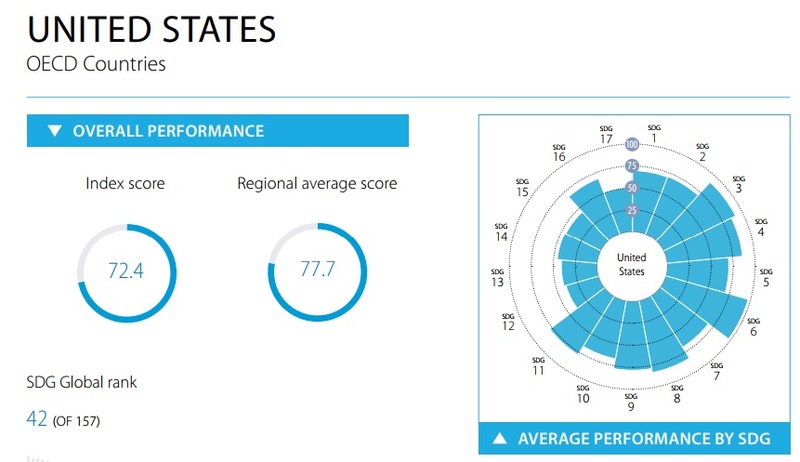 It doesn’t matter that every population that tries out capitalism…does better than under communism. …He might have murdered hundreds of political prisoners…the true metaphor of Guevara’s cigar smoking face is not one of moral courage, insurgent glory, and resolute intellect, but of a useful idiot for totalitarian propaganda. Even the establishment understands that there’s something wrong about Che idolatry, as illustrated by this Economist column. 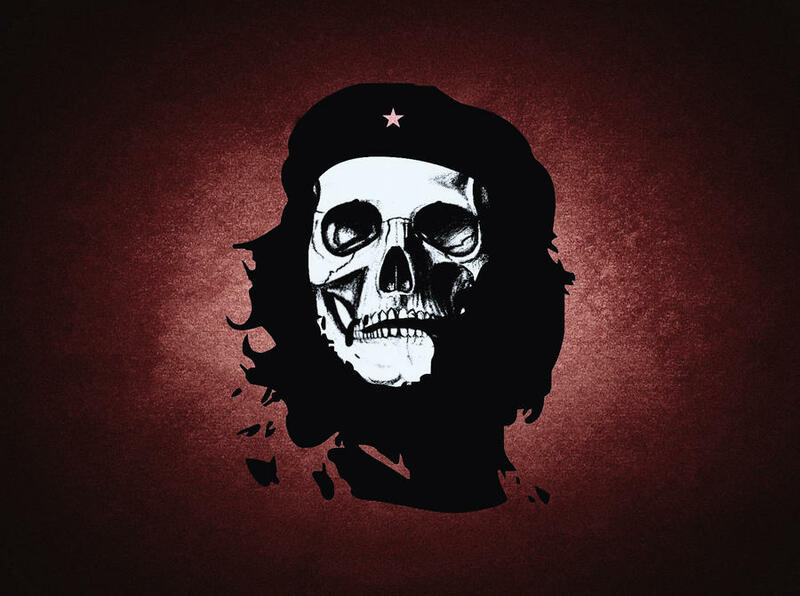 In death Che, with his flowing hair and beret, has become one of the world’s favourite revolutionary icons. His fans span the globe. …The ascetic, asthmatic Argentine doctor first fought alongside Fidel Castro in the mountains of Cuba’s Sierra Maestra. After the Cuban revolution had imposed communism on the island, Guevara left to try to “liberate” first Congo and then Bolivia. Those who idolise Che do so because they see him as an idealist who laid down his life for a cause. An aura of Christian sacrifice surrounds him. …In Guevara’s view, equality was to be achieved by levelling down. As minister of industries in Cuba, he wanted to expropriate every farm and shop. …the cost of miserable wages, the denial of opportunity and the brutal suppression of dissent. In Venezuela’s pastiche of the Cuban revolution, installed by the late Hugo Chávez, another Che fan, the masses have been impoverished while insiders have become fabulously and corruptly rich. …Not only does democracy offer the best hope of progress for the masses, it also protects the left against its own mistakes. It is long past time to bury Che and find a better icon. Let’s go back in time and look at excerpts from a 2004 Slate column. The cult of Ernesto Che Guevara is an episode in the moral callousness of our time. Che was a totalitarian. …Che was a mainstay of the hardline pro-Soviet faction, and his faction won. Che presided over the Cuban Revolution’s first firing squads. He founded Cuba’s “labor camp” system—the system that was eventually employed to incarcerate gays, dissidents, and AIDS victims. To get himself killed, and to get a lot of other people killed, was central to Che’s imagination. … “Hatred as an element of struggle; unbending hatred for the enemy, which pushes a human being beyond his natural limitations, making him into an effective, violent, selective, and cold-blooded killing machine. This is what our soldiers must become …”— and so on. …The present-day cult of Che—the T-shirts, the bars, the posters—has succeeded in obscuring this dreadful reality. …Che was an enemy of freedom, and yet he has been erected into a symbol of freedom. He helped establish an unjust social system in Cuba and has been erected into a symbol of social justice. He stood for the ancient rigidities of Latin-American thought, in a Marxist-Leninist version… I wonder if people who stand up to cheer a hagiography of Che Guevara…will ever give a damn about the oppressed people of Cuba—will ever lift a finger on behalf of the Cuban liberals and dissidents. 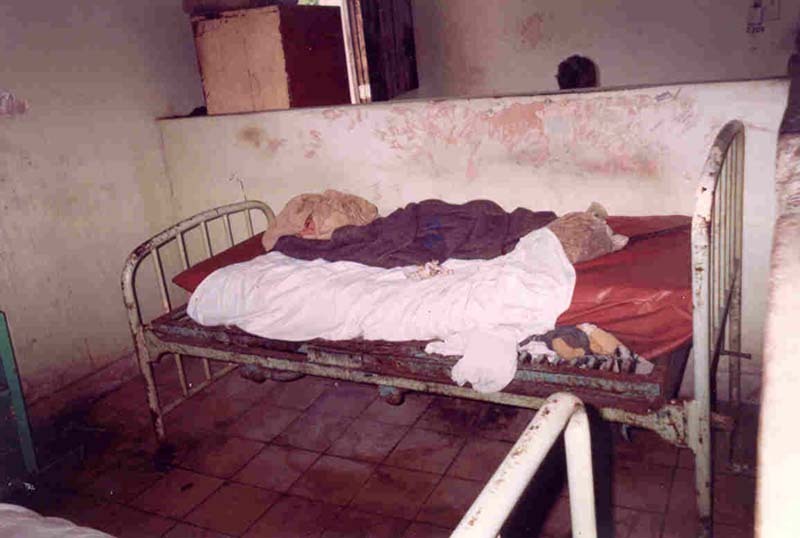 And here’s a grim body count from the Cuba Archive. Here’s some more background on Guevara from Politifact, including his murder of fellow Cubans and his racist attitude. This story, by the way, attempts to exonerate Guevara even though it acknowledges his racist pedigree. Guevara’s words in The Motorcycle Diaries were highly critical of the blacks he came across in that Caracas neighborhood, and he placed them beneath Europeans. The experts we consulted said the remarks are real and would not have been unusual coming from a 24-year-old from Argentina at the time. …We rate this claim Mostly False. So he was racist, but it’s “Mostly False” to say he was racist because he was a product of his times. Does anyone think Politifact would say that slaveowners in the 1840s weren’t really racist because they were products of their times? Likewise, who thinks defenders of the Jim Crow laws in the 1960s would get a free pass since they were products of their times? For some bizarre reason, leftists (and lots of vacuous college kids and brainless celebrities) want to excuse – or even justify – Guevara’s unsavory life. Indeed, notwithstanding a record of cruelty and hate, Che Guevara has a big contingent of fanboys. Such as the government of Ireland. An Post have issued a one euro stamp featuring the face of Che Guevara, a leading figure in the Cuban Revolution of the 1950s and 1960s. The stamp, which features a famous image of Guevara by Dublin artist Jim Fitzpatrick, commemorates the 50th anniversary of the revolutionary’s death on October 9, 1967. …Designed by Red&Grey, the stamp is based on Mr Fitzpatrick’s artwork, which appears on t-shirts, posters, badges and clothing worldwide and is now rated among the world’s top 10 most iconic images. I’m assuming Ireland’s vacuous president somehow played a role in the decision to honor Guevera. In any event, I can’t wait to see the new stamps for Hitler, Mao, and Stalin that the Irish postal service doubtlessly is preparing. The United Nations also is part of the Che death cult. With an impeccable instinct for venerating murderous thugs, the United Nations Educational, Scientific and Cultural Organization (UNESCO) has now added to its Memory of the World Register the writings of Cuba’s Ernesto “Che” Guevara. That means that the documents generated by Che during his bloody career will now be treated as historical treasures, protected and cared for with the help of UNESCO. What’s next? The teachings of Stalin and Pol Pot? …Che’s works were nominated for UNESCO’s special attentions by Cuba and Bolivia, and to be added to the UNESCO Register the nomination had to be endorsed by UNESCO’s director-general, Irina Bokova. You might suppose that as a former Bulgarian government functionary, from the days when Bulgaria orbited the Soviet Union, Bokova would be aware of the horrors behind Che’s radical “cool.” But Bokova appears to suffer from a longstanding infatuation with Cuba’s repressive regime. …one might wish for a UN cultural organization endowed with at least some hint of a moral compass. We’ll start with Johan Norberg’s succinct summary of Guevara. Reason has a video about the Che fetish, with a special focus on Hollywood’s moral bankruptcy. Let’s close on an uplifting note. Some people are waking up on the issue, as noted in a report from the Economist. Che Guevara was born in Rosario, then Argentina’s second-largest city… A red banner marks the posh apartment block where he was born. A four-metre-high (13-foot) bronze statue stands in Che Guevara Square. The city council finances CELChe, a centre devoted to the study of his life, and celebrates “Che week” around his birthday in June. …Not everyone in Rosario thinks the bereted revolutionary…deserves such reverence. Fundación Bases, a liberal think-tank based in the city, has launched a petition to persuade the city council to remove the monuments. The martyr was himself a killer, says Franco Martín López, the institute’s director. Guevara was second-in-command to Fidel Castro, whose Cuban revolution killed more than 10,000 people. …Under the motto “a murderer doesn’t deserve state tributes”, Mr López’s foundation has produced videos to educate Argentines, and rosarinos in particular. One shows a clip of Guevara promising to “continue the firing squads for as long as necessary” in a speech to the UN General Assembly in 1964. In another, a narrator reads out the accusatory suicide note of Reinaldo Arenas, a gay novelist who died in 1990 after suffering decades of persecution by Cuba’s government. …Norberto Galiotti, the cigar-smoking secretary of Rosario’s Communist Party, …suspects liberals are envious of Che’s posthumous charisma. “You don’t see many kids walking around with Margaret Thatcher T-shirts,” he observes. I rarely agree with communists, but it is sad that kids are more likely to idolize Guevara than a great leader like Margaret Thatcher. By the way, my disdain for Che and the Cuban dictatorship does not mean I support a trade embargo by the United States. Such a policy may have been appropriate when the Soviet Union still existed and was using Cuba as a proxy regime. But that’s no longer the case. Yes, the current regime in Cuba is still deplorable. It impoverishes and oppresses its own people. But that description applies to a lot of nations that have normal economic relations with the United States. If we allow trade and travel with China, Venezuela, and Saudi Arabia, the same should be true for Cuba. The bottom line is that we can have economic relations with unsavory nations. Even with nations that produce evil people like Che Guevara. P.S. Returning to the topic of Che Guevara fanboys, don’t forget the cynical actions of Mercedes-Benz. But at least the company apologized. P.P.S. 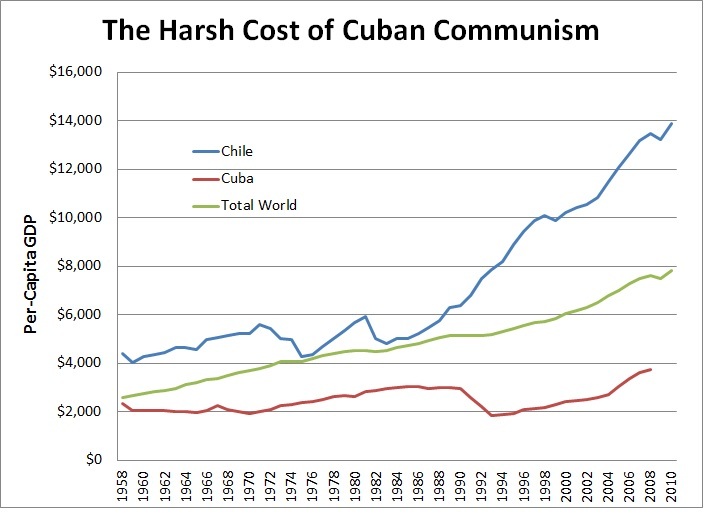 If you want to understand the economic impact of communism, consider the astounding fact that Cuba and Hong Kong had similar living standards in the late 1950s. 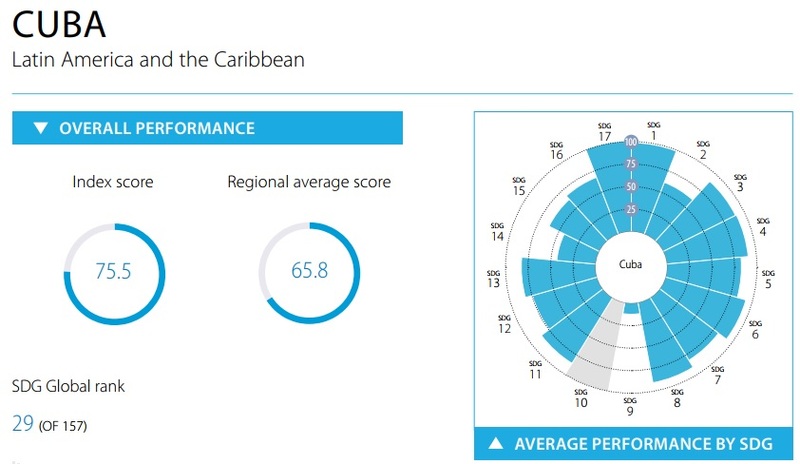 What Can Hong Kong and Cuba Teach Us about Economic Policy? 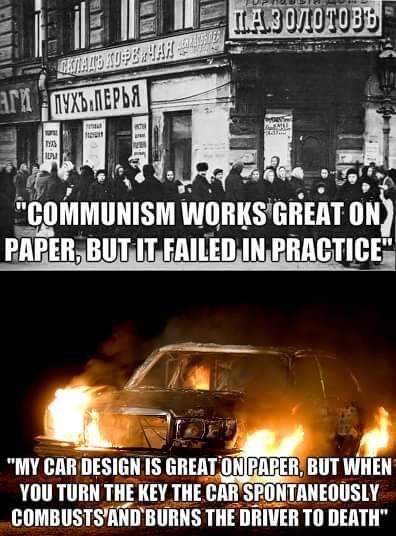 Early this year, I shared an amusing but accurate image that showed an important difference between capitalism and socialism. And in 2012, I posted a comparison of Detroit and Hiroshima to illustrate the damage of big government. 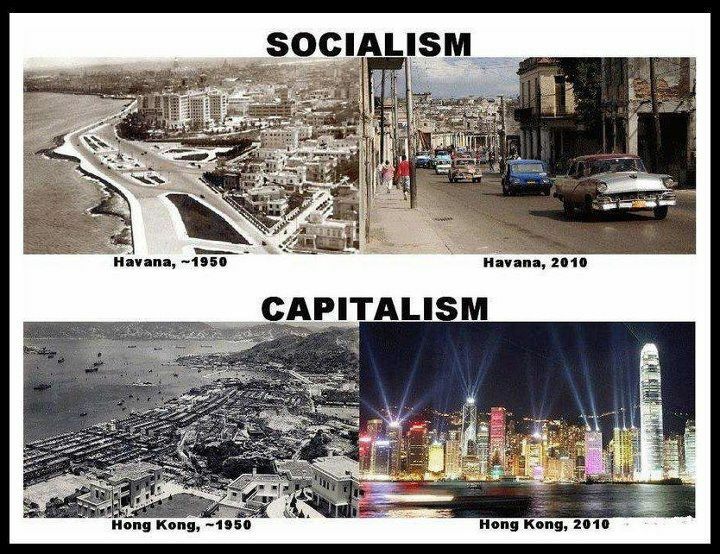 Well, if you combine those concepts, you get this very pointed look at the evolution of Cuban socialism and Hong Kong capitalism. Some might dismiss these photos as being unrepresentative, and it’s reasonable to be skeptical. After all, I’m sure it would be easy to put together a series of photos that make it seem as if the United States is suffering from decay while France is enjoying a boom. So let’s go to the data. 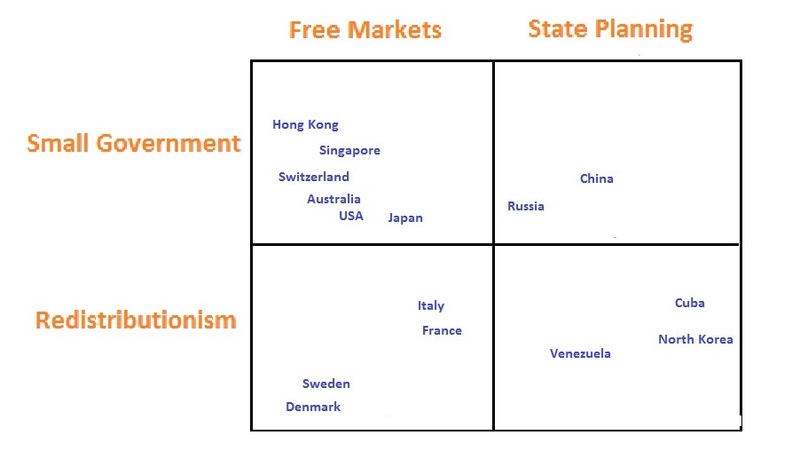 In previous posts, I’ve shared comparisons of long-run economic performance in market-oriented nations and statist countries. Examples include Chile vs. Argentina vs. Venezuela, North Korea vs. South Korea, Cuba vs. Chile, Ukraine vs. Poland, Hong Kong vs. Argentina, Singapore vs. Jamaica, and the United States vs. Hong Kong and Singapore. Now let’s add Cuba vs. Hong Kong to the mix. Wow, this is amazing. 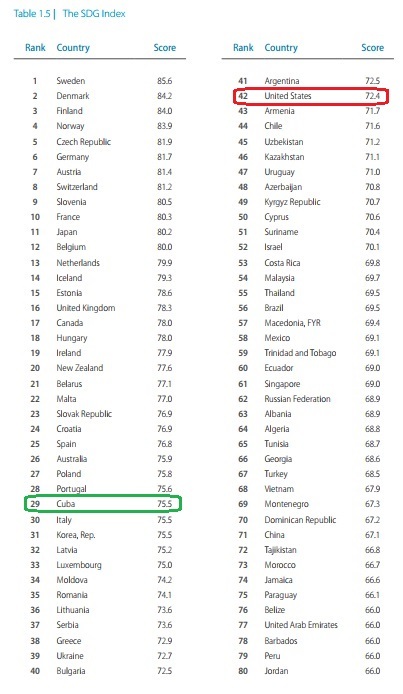 Through much of the 1950s, Hong Kong and Cuba were economically similar, and both were very close to the world average. 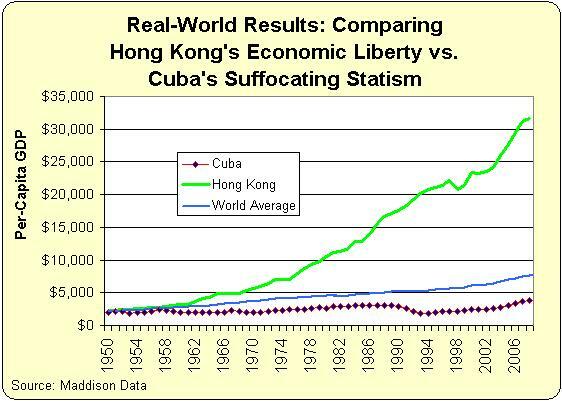 Then Hong Kong became a poster child for capitalism while Cuba became an outpost of Soviet communism. And, as you might expect, the people of Hong Kong prospered. What about the Cubans? Well, I suppose a leftist could argue that they’re all equally poor and that universal deprivation somehow makes Cuban society better Hong Kong, where not everybody gets rich at the same rate. But even that would be a lie since Cuba’s communist elite doubtlessly enjoys a very comfortable lifestyle. So while the rest of the country endures hardships such as a toilet paper shortage, the party bosses presumably drink champagne and eat caviar. The bottom line is that statists still don’t have an acceptable answer for my two-part challenge. P.S. If you prefer stories rather than images or data, this updated version of the fable of the ant and the grasshopper makes a key point about incentives and redistribution. And you get a similar message from the PC version of the Little Red Hen. P.P.S. Cuba’s system is so wretched that even Fidel Castro confessed it is a failure. So maybe there’s hope that Obama will have a similar epiphany about American-style statism!